This hotel is 100pct non-smoking The Hampton Inn Bakersfield-Central hotel is directly off Hwy 99 /Exit California Avenue/ directly in the center of town so our guests are close to everything. Bakersfield area attractions include Camelot Park Fun Center Meadowsfield Airport Kern River baseball historical sites museums golf courses Rabo Bank Convention Center and Arena and NASCAR racing events. Within 1 mile our Hampton Inn guests can dine at Marie Callender*s Mimi*s Cafe Hungrey Hunter Mexicalli or Pizzaville. 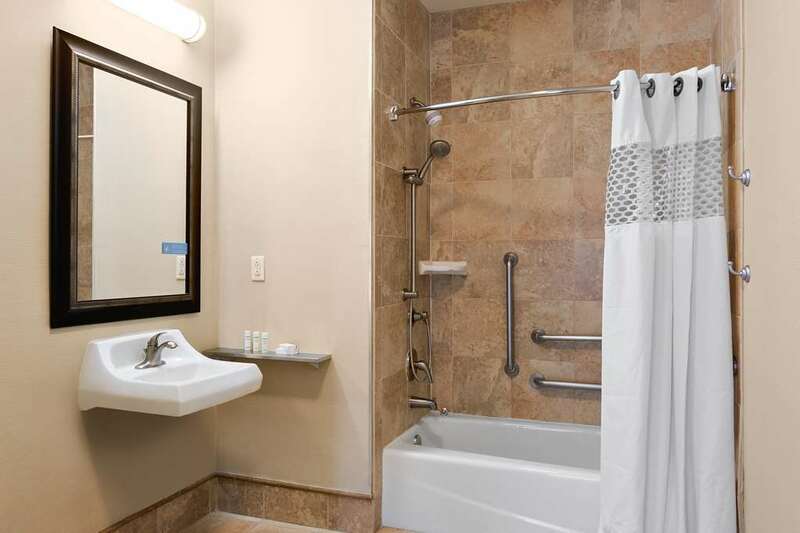 The Hampton Inn Bakersfield-Central hotel features 93 rooms some equipped with sofa sleepers complimentary parking exercise gym and outdoor heated pool. Whether traveling to California on business or pleasure Hampton Inn hotel guests enjoy amenities which include free hot breakfast free local calls free WiFi free copy and fax service and a business center. Our guest rooms are equipped with microwave refrigerator coffeemaker hair dryer iron and ironing board and TV with full cable /including HBO/. We also offer connecting rooms cribs and audio/visual equipment. Laundry/valet services and a small meeting facility are available for a nominal fee. Room service from Hungrey Hunter Steakhouse is also available. We love having you here at the Hampton Inn Bakersfield-Central hotel in California. Hungry Hunter Steakhouse: Steaks Ribs Chicken Salads ect. in a comfortable and attractive settingThis restaurant also provides room service to our hotel.